On October 10th 2017, my life took on a whole new meaning as I became a mother for the first time. Little Theodore made his long awaited debut in style after keeping us waiting for 8 whole days past my due date! 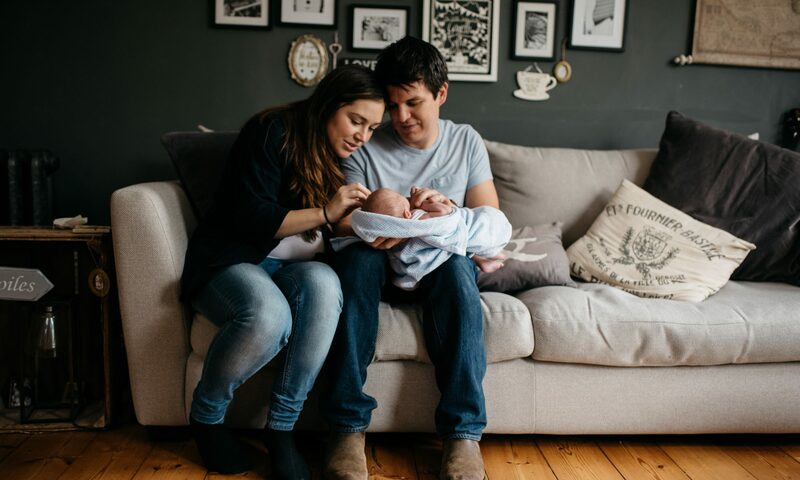 The days, weeks and months that followed seemed to whizz by in a flash and somewhere along the line, my tiny newborn blossomed into a healthy 14 week old baby! It’s not been an easy initiation into motherhood (is it ever!?) but hopefully the dreaded colicky evenings seem to be a thing of the past which means I get to spend some time with my husband and enjoy some wine! It also means I have time to pick my blog back up again after neglecting it for the past year for various reasons. I started TKBS blog to allow me to indulge in my unhealthy obsession with all things beauty related but that was before I had a tiny human to grow and look after. I still plan on writing about beauty but I’m also going to share with you my experiences of pregnancy and motherhood (and hope to hear about yours too). It was about this time last year that I first found out I was pregnant so that seems a good place to start. Keep an eye out for my post to follow on the first trimester…ah the nauseous feelings come flooding back just thinking about it! The not so amazing face…. I managed to pick up an amazing Emma Hardie set in the January sales which included the vitamin C intense daily serum and the vitamin C face cream. Having previously used the balm I was super excited to start using these products! I apply a serum twice a day and normally like to wear it under my makeup with a moisturiser for my day to day face. Unfortunately the Emma Hardie serum does not seem to like being applied with other products! From the very first time I used it I could tell it was going to cause me problems. Despite using a moisturiser on top, my foundation would just not sit well. Instead it would congeal and clump together giving a really attractive patchy finish. I couldn’t find anything to improve the finish to the point I’ve had to restrict it’s use to night time only. I’m also not a bit fan of the smell and it can feel a little bit tacky when first applied but I think that’s a common find with Vitamin C products. Moving on to the moisturiser. When I first took the lid off, my eyes lit up as it revealed a gorgeous thick cream which looked really hydrating. I applied it over the serum. It wasn’t the easiest to apply, I can only describe it like when you rub soap into your hands without adding water. And again it felt quite tacky at first. When it did eventually absorb in, my skin felt quite tight like there was a residue on top. Not quite what I was hoping for! I think I will be saving this for night time use only too. I was a little bit dissapointed to say the least but just glad I didn’t pay full whack for the products. Having looked at reviews on other websites, it seems to be a common complaint regarding the serum in particular. I’m keen to learn more about green beauty and organic skin care products. I have some Pai and May Lindstorm products which I will move on to next and report back! What were your thoughts on the Emma Hardie products mentioned? So as well as being a self confessed beauty addict, I may also be a little bit of a hoarder; two things which do not go well together. Even I now admit space is becoming a problem in my dressing room aka glorified cupboard. I always like to keep the boxes that perfume/beauty sets come in as they are normally good sturdy boxes, perfect for keeping even more products in! Cut to dozens of boxes stuffed in shelves with a vague idea of what’s in what (but I usually get it wrong and have to go through them all anyway). The reason why I’ve ended up like this…I probably have too much stuff. Hence why i’m imposing dry January on myself. No i’m not cutting alcohol out, something far worse, I’m banning myself from buying any more beauty related products. I basically need to get better at using what I have and appreciating it. So I’ve decided to rationalise my skin care routine and try and stick to it for the next month. I’ve selected one moisturiser, cleanser, serum and night cream to use. They are all products I’m using currently but some of them I opened nearly a year a go so I need to use them up soon! Ceramic Slip cleanser – Sunday Riley. I originally bought this for my husband but getting him to actually use it proved too much. It’s ok, not quite what I was expecting and I probably would’t buy it again. Ultra Facial Cream – Kiehl’s. Good moisturiser especially with this cold weather! Advance night repair – Estee Lauder. One of my favourite serums. Pixi Glow Tonic. Another cult beauty product. I wasn’t blown away with it’s effects personally but I’m going to use it religiously over the next month and see how my skin reacts. Dragon’s blood hyaluronic night cream – Rodial. I got this for Christmas and so far I am enjoying using it. It does feel hydrating and has a lovely creamy texture to it. So that’s my challenge over the next month. I’m actually quite keen to use some of them up so I can open my new Emma Hardie products that I have waiting in the wings! Have you set your self a challenge for the new year? Let me know. My husband who is big into self improvement tells me that it’s good to physically write goals down at the start of the year (he’s practising yoga on our bedroom floor as I type – one of his goals for 2017). So with this in mind, we ventured out to a cosy pub today to write them together. It lasted 5 minutes. I soon became irritated by his grand ideas when I knew in reality I would never be able to achieve them. For example, eating fish twice a week. I HATE fish. He knows it too but that doesn’t stop him trying to shove his cod in my mouth at lunch today (I said ‘cod’). Like a lot of you I’m sure, I feel that my life is being dominated by my work at the moment which makes even little tasks like cooking dinner seem like a big deal. Bad habits have become the norm and I ended 2016 barely squeezing into a black jumpsuit, with a muffin top to boot. This is not who I am! Exercise at least twice a week including Run Like a Girl and Parkrun. Rely on dry shampoo less or get hair chopped off so it’s not such an effort to wash it! Do what makes me happy, life is short…and on that note, gain a level 7 certificate in aesthetic medicine and see what happens! I’ve already failed number 1. Ah. Must get to bed! Happy New Year to you all! Have you got any goals? Lets encourage each other. Good Genes has been in my life for just over a year now and for me, it’s a very unique product unlike anything else I have tried. I always find it generates a lot of questions whenever I post about it on Instagram so thought I would share my experiences of the product with you all. Good Genes is a lactic acid treatment which can be used daily or occasionally as a mask. It claims to boost your complexion, plump fine lines and even help to reduce hyper-pigmentation over time. Generally it helps to exfoliate your skin with pretty quick results. Its consistency is cream-like and after months of racking my brain, trying to remember what its smell reminds me of, I can now smugly say it’s Refresher chew bars! Next time you use it, you’ll see what I mean! For those not familiar with this childhood favourite of mine, it has a quite a distinct citrus smell. Not something I was a fan over in the beginning but the more I’ve used it, the less I’ve noticed it. When I first started using this product, I applied it consecutively for around 4 nights. That’s when the burning started to set in. It would hit around 5 seconds after applying, a really irritating, itchy burning sensation – like when someone is tickling your feet and you just cant get away! I was initially really disappointed but then I realised I had just been over killing it. The pH of the product is pretty low which means it’s acidic and therefore can be quite irritating to the skin, especially if you have sensitive skin or use it frequently. I would advise that you don’t use this product daily. I now use it 1-2 times a week (which also means it lasts a lot longer). So the reason why I think a lot of people love this product is because it has visible results which are seen very quickly. I find this product works best for me if I apply it at bedtime with my serum. When I wake up in the morning my skin has a visible glow about it. I’ve also noticed that with time, chronic scarring that I had around my chin is beginning to fade. I don’t suffer with hyper-pigmentation so I can’t comment on this. I think the slight sticking point with this product is its price tag. At £85 for a 30 ml bottle, it’s not something you would buy without doing a little bit of research first. I’ve recently bought my second bottle after a brief pause to see if I could cope without it (obviously not). As I said in the intro, I haven’t been able to find a cheaper alternative that has the same effects. I see it the same as an investment piece for my wardrobe. It’s there when I need to get my skin looking good quickly! Have any of you tried it? What did you think? My Christmas gift list for the beauty lover! Less than 4 weeks to go to till Christmas-argh! How did this happen!? It was only Halloween 5 minutes ago. I’ve been so busy recently with work/house falling apart that Christmas hasn’t even entered my head, more specifically Christmas shopping! My family are only doing smallish presents this year as we are hiring a house in the Cotswolds for my mum’s 60th birthday instead, which falls a few days before Christmas – I can’t wait! With a small budget in mind, I thought I would share with you some great beauty gift ideas, sure to be a hit with any beauty lover out there! Possibly the best highlighter ever? Becca has been one of my favourite brands this year. If you’re someone who loves your makeup with a glowing, dewy finish like me, this little set will not disappoint! 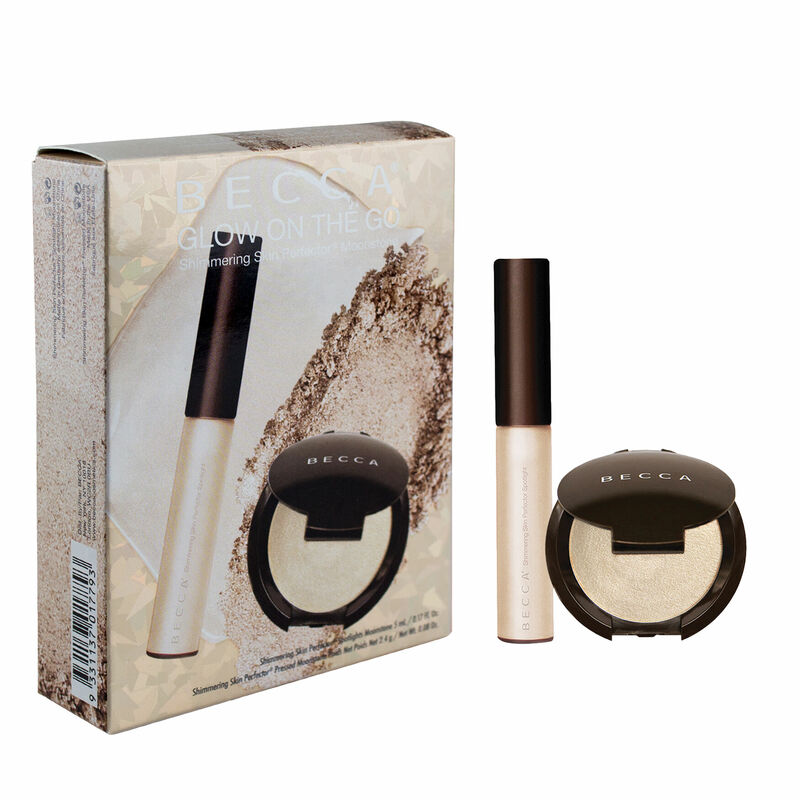 The Becca highlighter is available in 3 formulations and this gift set allows you to try it out in the pressed powder and liquid form. I bought mine from Space N.K for £20 but it’s also available from Cult Beauty. I have bought products from the ‘thisworks’ range for my sister for the last 2 years running and finally decided to try it for myself after her rave reviews. This little bauble set allows you try out their ‘Sleep tight’ products which include a 5ml pillow spray and roll on rescue remedy. I’ve been using them myself recently and they really do have an instant calming affect, great just before bed! If I had this in my stocking on Christmas day I would be a very happy girl! 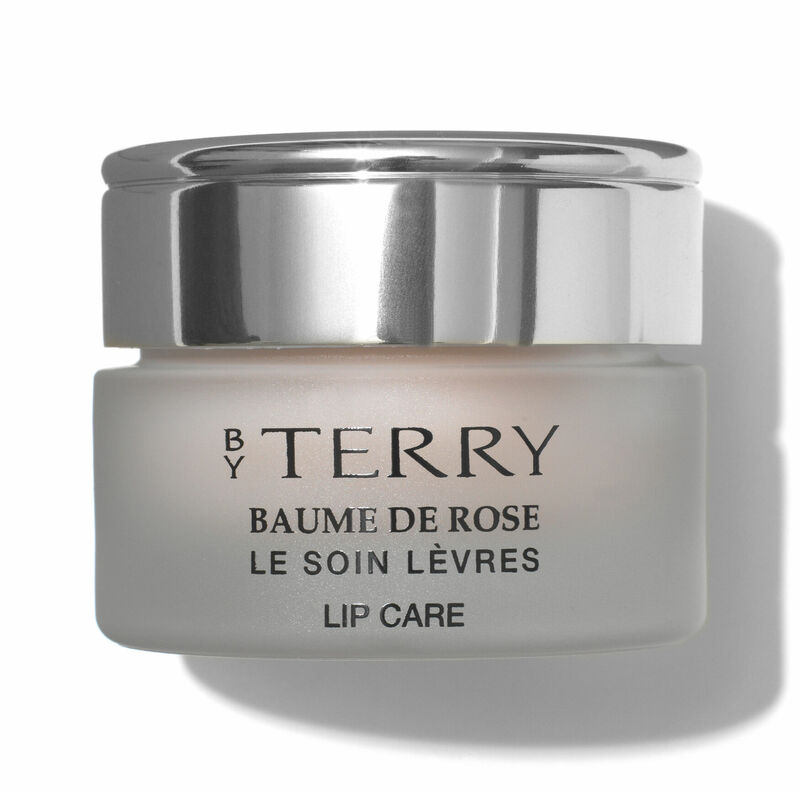 Baume de rose is a dream of a lip balm! It smells amazing and makes lips look instantly gorgeous and kissable – my fave! It might be stretching the budget slightly at £39 but it will last for months! Marks and Spencer have got some great Pixi gifts on offer this year but this one seemed to be the best value at a reduced price of £30 from £72. It includes their famous Pixie Glow Tonic and would be sure to make someone very happy on Christmas day! 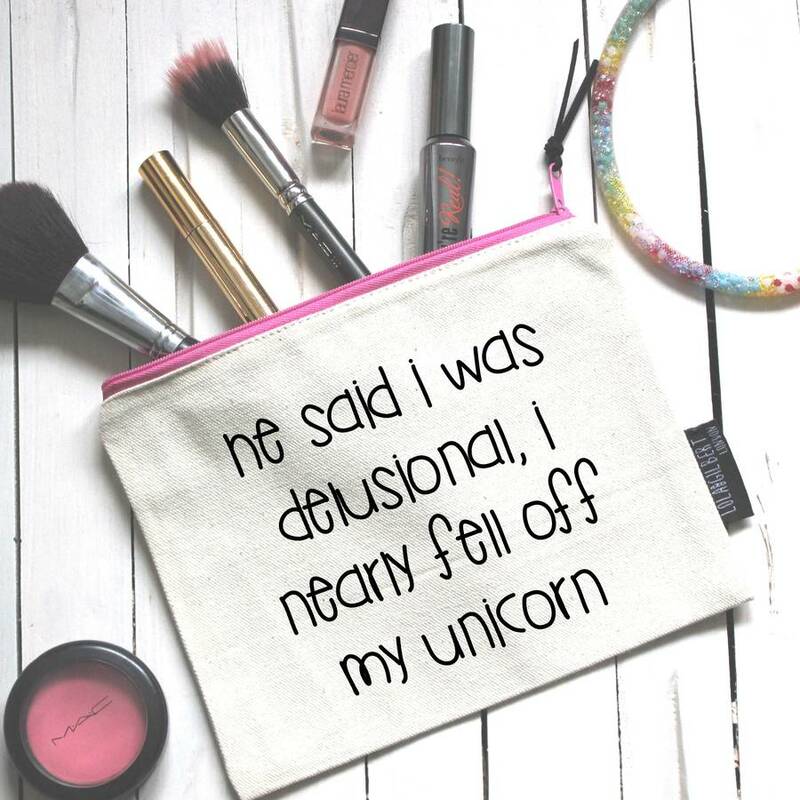 One thing I find I can never have enough of is make up bags! I loved this one by LOLA & GILBERT LONDON LTD. Check out their full range available from notonthehightstreet.com to find the perfect bag that sums up your friend or sister. 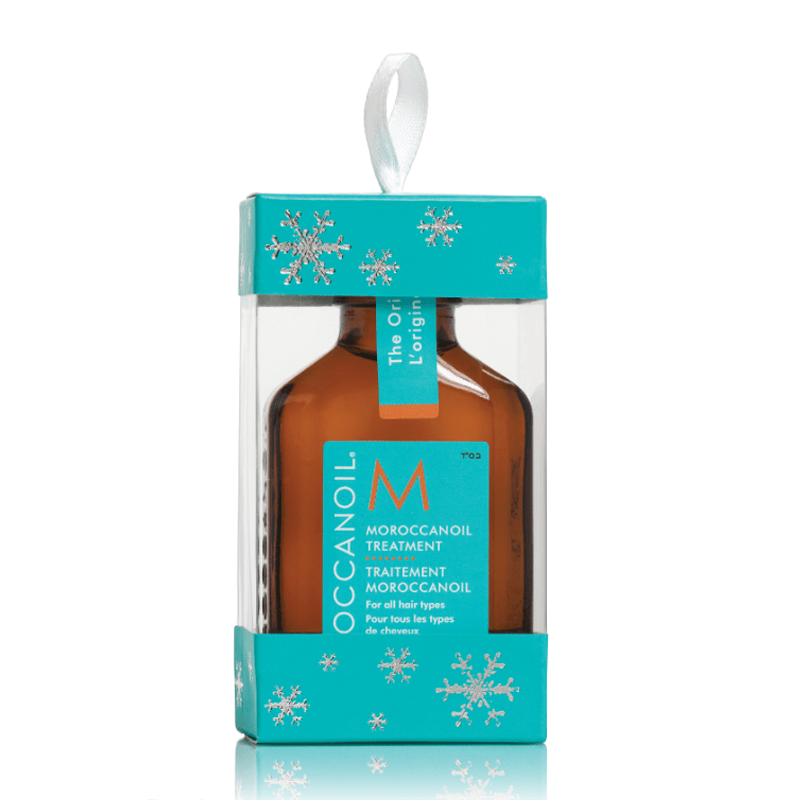 I’m not massively into hair products and posh shampoos and conditioners but the one thing I use religiously is Moroccan oil. I think it makes a lovely gift as it’s a little bit of a luxury and it’s nice to make people feel spoilt at Christmas. You can buy this dinky little bottle from feel unique for £13.45 (and most hair salons) but my advice would be to buy the bigger bottle which you can pick up for around £31. It’s much better value for money and will last nearly the whole year as you only need a small amount per application. 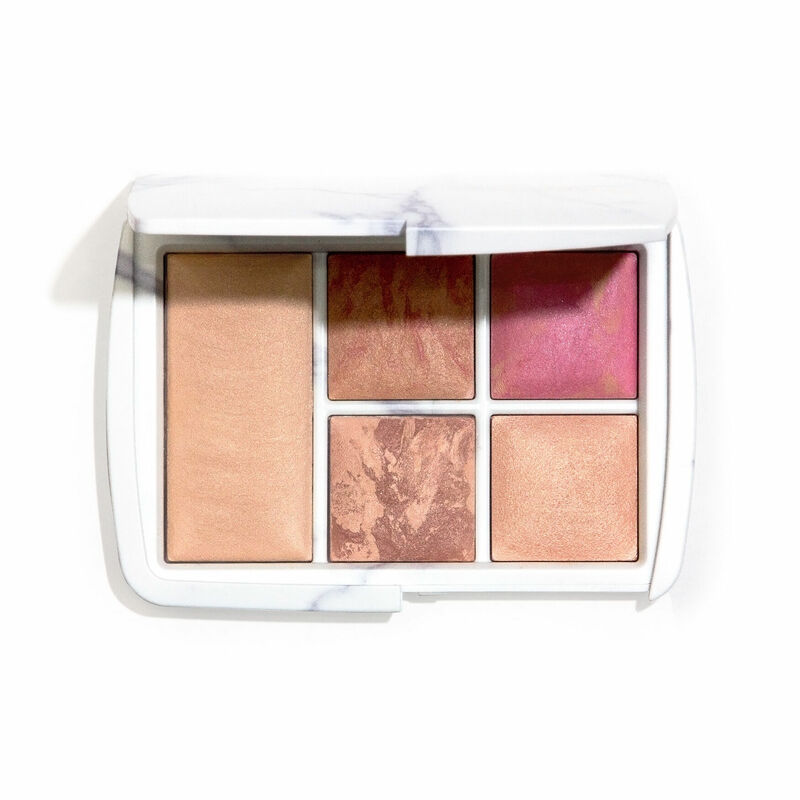 Ok, so this Surreal Light palette from Hourglass may completely blow the small budget but it’s just so pretty I had to include it! They brought out the Ambient lighting palette last year but now they have 5 more exclusive shades which enable you to highlight, sculpt and generally make yourself look gorgeous with! At £69 it’s not cheap but you can buy the Ambient strobe lighting powders individually for £34. Also, how amazing is the packaging!? I first came across the brand Le Labo during a trip to Hawaii. I fell in love with the Rose 31 body lotion but couldn’t find it anywhere in the UK on our return. That was until this year when I discovered the brand is now stocked in Liberty! Le Labo was founded in New York and they are really known for their amazing fragrances. I would love the Rose 31 eau de parfum but at £165 a bottle I think I will have to wait for a special occasion. Never fear though as their body lotions and shower gels range between a more affordable £32-41 and smell equally as divine. What every beauty lover needs, somewhere to put all that makeup! I’ve got a couple of these at home and they are great. I can organise all my lipsticks, makeup brushes and foundations. It makes it really easy to find what I’m looking for and to keep my surfaces clear. This particular one is £13 from John Lewis but they are very easy to get hold of from various places and in various designs. It wouldn’t be Christmas without some sparkle! This cute Nails Inc set comes with 2 polishes and a gorgeous cosmetics bag! I know my cousins would love this gift! Available for £20 from John Lewis. So that’s my round up of beauty related gifts! I hope it’s helped anyone struggling with ideas this year. Enjoy the run up to Christmas! Project save Filmstar Bronze and Glow! During my holiday in July, something awful happened…my Charlotte Tilbury Filmstar Bronze and Glow ended up on the floor and smashed into tiny pieces! (You can ask my husband how that happened – we’re just about talking again). I love this palette, it’s so easy to use and *was* part of my daily makeup routine for work. I bought it in the run up to my wedding over 2 years ago and still had plenty of use left in it despite wearing it all the time! Really worth the £49 it cost to buy it. I had heard of the ‘alcohol trick’ and set about researching it which involved watching lots of videos online. A lot of them were american and they talked about using rubbing alcohol which I believe is not easy to get hold of in the UK. Apparently the trick works best with an alcohol concentration of at least 70% or above. I read that it is possible to use surgical spirit instead which I easily picked up from my local Boots store for a couple of pounds. 1.Surgical spirit ( or rubbing alcohol). Only a very small amount is required. Using your dropper, sprinkle a few drops at a time of surgical spirit onto the crushed powder until it starts to melt together. It doesn’t need to be completely saturated but damp enough to allow you to press it together so that it holds. Using the back of spoon, apply a small amount of pressure as you smooth over the powder, pressing it back together as you go. Allow to dry out for a couple of hours before using it. Here’s the final result! Yes it may have a slight smell that makes you feel like you’re at the dentist but at least it’s usable again! Success! Have any of you tried it!? You’ll know when I’m tired because my eyes will sink behind dark puffy circles; a look I’ve been sporting a lot recently- attractive! I find the puffiness hard to treat (Sisley Eye contour mask is pretty good) but my staple beauty product for when I’m working nights is Nars’ Radiant Creamy Concealer! I first bought this product over 2 years ago and fell in love with it instantly. After years of buying drug store concealers (which were awful) I decided to splash out and try this cult product (RRP £22). The first thing I noticed was the amazing coverage it provides. I often get angry looking spots and this would help minimise their appearance significantly. As the name suggests it does have a creamy texture which helps the product to stay in place. One thing I found with cheaper concealers is that as soon as you applied other makeup, the concealer would move and provide no benefit whatsoever. The product is described as radiant but in my opinion I would say it sways slightly more to the matte side which I don’t necessarily think is a bad thing. The last thing you want is to draw attention to the areas you’re trying to conceal with light-catching shimmer. (YSL Touche Eclat springs to mind). The longer I’ve had the product, the more wonderful uses I have found for it! As well as concealing blemishes, I now use it under my eyes, forehead and cupid bow to help sculpt and define certain features (demonstrated in the glamorous photos above). It’s amazing and so easy to use. Just apply with the wand and blend with your fingers, makeup brush or sponge. For blemishes, I prefer to dab a bit on my finger and apply to my face to try and keep the wand clean. My shade is called ‘Vanilla’ and is one of 10 shades this product is available in. £22 may sound expensive but my first tube lasted me over 2 years and the only reason I had to buy another one was because I lost it! A little really does goes a long way with this product! You may have noticed I’ve been a little M.I.A. recently on the blog front. Apologies for that but every spare moment I’ve had, I’ve been revising for a medical exam. Now that it’s out the way (for now) I thought I would kick off my 2 weeks of ignorant bliss with a review of Skinesis’s new Lip Enhancer. Amazingly, my friend won us one each in a competition celebrating international friendship day (we never win anything so it was rather exciting!). The double ended lip enhancer consists of a power base and a tinted balm and normally retails at £29.The power base acts as a lip primer to smooth and plump the lips. It contains Hyaluronic acid and ‘Neodermyl® ‘needle-free’ filler’. It has a creamy consistency which goes on to leave a sheer, matte finish. It has an instant blurring effect and really does smooth over even my permanently dry, rough lips. I used it in conjunction with the tinted balm but I would imagine you could use it with other lip products as a base. Once applied, it felt fixed on the lips- it didn’t easily come off with sipping a drink for example. Power base on the left. Tinted balm on the right. The tinted balm is clear in colour initially but develops later on the lips into a natural looking rosy colour. It reminded me of Dior’s Glow Addict balm, which adjusts to your own lip colour in the same way. It is a glossy lip product which lasts for a good amount of time. I found it great for adding a little bit of glamour to a natural look but would maybe think twice about wearing it at work. Me not doing the product justice at all i’m afraid! The product is advertised as anti-ageing and advises the consumer to apply it multiple times a day. My only negative point about the product would be the size of it! The tubes are fairly small and I would imagine if you were to apply it multiple times a daily, everyday, you would be lucky if it lasted you a month. I therefore keep mine for special occasions rather than as a daily lip balm. Let me know if any of you have tried it and what you thought! I hope you’re all having a lovely Friday! I’m currently facing the usual dilemma post-nights; to sleep or not to sleep!? I’ve made it to 13:00 so far so thought I would write a blog post to keep me occupied (with any luck I’ll be sleeping like a baby tonight). You may have noticed from my Instagram feed that I’ve recently returned from a holiday in a very pretty town called Saint-Rémy found in the Provence region of France. We found a beautiful converted farmhouse on Airbnb which was surrounded by luscious vineyards and lavender, the perfect place to relax. We also drank some of the best wine we have ever tasted, shame we couldn’t bring any back with us! Ok,enough holiday snaps, lets get down to what this blog post is really about; L’Occitane’s Divine cream! So you may remember that L’Occitane celebrated it’s 40th birthday earlier this year and as a thank you to it’s customers, they gave away this gorgeous little gift below. Luckily for us it included a small sample pot of their award winning Divine cream (full size worth £74). There was no way I was missing out on this! So since the brand was founded in the Provence region I thought it only apt that I bring it on holiday with me and test it out. The Divine cream forms part of the Immortelle range, which takes it name from the golden flowers grown on the island of Corsica, known for their longevity even after being picked. The product contains a blend of Immortelle’s essential oil and cells extract in combination with other ingredients including Marsh Clover, Myrtle, Honey, Bellis Perennis, Hyaluronic Acid, Evening Primrose Oil and Camelina oil. The product claims to help reduce fine lines and wrinkles, even out skin tone, and improve the firmness and elasticity of your skin. It’s difficult for me to comment on it’s effectiveness with regards to minimising wrinkles as I only had a weeks supply and also I’m not in the targeted age group for this product. I did however really like it! I applied the product at night time.It was so hot during the day I needed to use my Soltan BB cream factor 50 for my face. The Divine Cream has a very pleasant botanical smell with a creamy texture that feels very moisturising. It’s easy to apply and absorbs quickly into the skin leaving it feeling nourished and hydrated. I was impressed that my skin still felt hydrated when I woke up in the morning and had a lovely glow to it. It’s not often that I’m impressed by a moisturiser but I really liked this one…dare I say it…*whispers* I may even prefer it to Creme De La Mer – eek sorry!